The Plano Dentist believes everyone deserves a beautiful smile. Modern procedures like dental implants can restore damaged smiles. Simply stated, a dental implant is a permanent post placed into the jawbone with attached abutment and artificial tooth. Implants can also support a dental bridge or denture. Ideal candidates for an implant include patients with missing teeth, dentures, or bridges who have healthy oral tissue, ample bone structure, and proper health for bone healing. For most of our patients who seek tooth restoration, a dental implant is an ideal option. An initial visit with The Plano Dentist is the first step. For this evaluation be sure to bring pertinent medical information, your current medication list, and questions you have about the process. Dental implants take multiple visits and the process is different for each person so be sure you understand all the details. If we determine that you don’t have enough bone structure at the implant site, bone grafting may be needed. Avoid drugs or medications not approved by your dental caregiver. Eat soft foods for a while to give your mouth time to heal after the implant is inserted. Keep the mouth cleaned properly around the site. Follow the counsel given at each visit. Stay healthy by eating a nutritious diet and getting proper rest. Avoid smoking or other tobacco products. 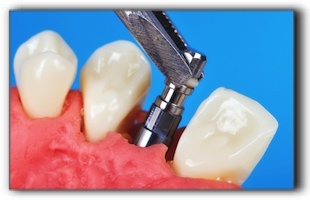 Caring for implants is not much different than caring for remaining teeth. Be sure to steer clear of damaging, dangerous habits such as chewing hard items (ice or candy), and seek treatment for teeth grinding if it is a problem for you. See your dentist regularly. Keep the implant and gum tissue around the implant clean just as you (hopefully) do with your original teeth. The complete dental implant process can take a few months from initial visit to the placement of the abutment and artificial tooth. The Plano Dentist also provides general dentistry. Schedule an appointment with us today.